Glock Firearms and factory accessories for sale Allsport Performance Inc Hermon, Maine See our great selection of Glock handguns and factory accessories at low prices. We have many calibers, sizes, and color options in stock. Come see us at our retail store. When you arrive you will be greeted by the owner that will help you find the right firearm to fit your needs. Whether it is for conceal carry, home protection, shooting at the range or to take with you hunting we can help you. We stock many brands of firearms but if you don't see the make or model you are looking feel free to contact us about ordering. You can have confidence in the inventory listed as this page is updated daily before we open as well as throughout the day. We have been serving the Bangor area and beyond since 1997. As a licensed dealer we buy, sell, and trade all types of firearms. We give fair trade values and offer fair prices for your individual guns or estate collections. Why go to Old Town, Lincoln, Holden, Ellsworth, Fairfield, Palmyra or other shops in Maine when you wont find a better price or selection. I think you will find that we are one of the best gun shops in Maine. When you purchase a new Glock from us we will give you Glock accessories to go along with it. Depending on availability. Glock 17 Gen4 Maine - FAMILY: G17 Series MODEL: G17 G4 TYPE: Semi-Auto Pistol ACTION: Safe Action FINISH: Gas Nitride STOCK/FRAME: Polymer Frame STOCK/GRIPS: Black Polymer CALIBER/GAUGE: 9mm CAPACITY: 17+1 # OF MAGS: 3 MAGAZINE DESC: 17 rd. BARREL: 4.49" OVERALL LENGTH: 7.32" SIGHTS: Fixed SAFETY: 3 Safeties ADDL INFO: Interchangeable Backstrap ADDL INFO: Reversible Magazine Catch ADDL INFO: Textured Grip GUN CASE: Plastic. Glock 19 Gen4 Maine - FAMILY: G19 Series MODEL: G19 G4 Flat Dark Earth TYPE: Semi-Auto Pistol ACTION: Safe Action FINISH: Gas Nitride STOCK/FRAME: Polymer Frame STOCK/GRIPS: Flat Dark Earth Polymer CALIBER/GAUGE: 9mm CAPACITY: 15+1 # OF MAGS: 3 MAGAZINE DESC: 15 rd. BARREL: 4" SIGHTS: Fixed SAFETY: 3 Safeties ADDL INFO: Interchangeable Backstrap ADDL INFO: Reversible Magazine Catch ADDL INFO: Textured Grip GUN CASE: Plastic. 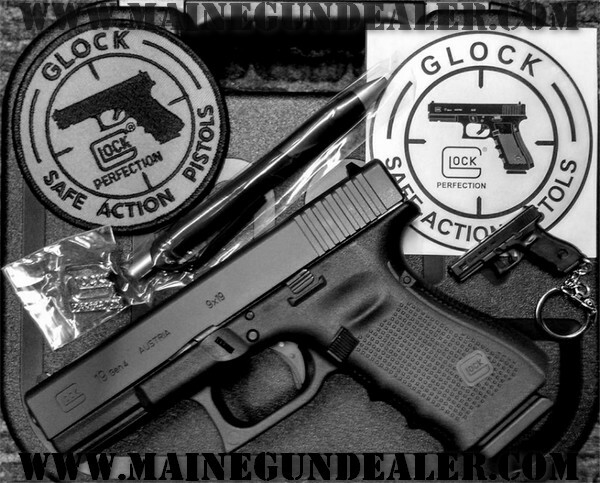 Glock 19 Gen4 Maine - FAMILY: G19 Series MODEL: G19 G4 GRAY TYPE: Semi-Auto Pistol ACTION: Safe Action FINISH: Gas Nitride STOCK/FRAME: Polymer Frame STOCK/GRIPS: GRAY Polymer CALIBER/GAUGE: 9mm CAPACITY: 15+1 # OF MAGS: 3 MAGAZINE DESC: 15 rd. BARREL: 4" SIGHTS: Fixed SAFETY: 3 Safeties ADDL INFO: Interchangeable Backstrap ADDL INFO: Reversible Magazine Catch ADDL INFO: Textured Grip GUN CASE: Plastic. Glock 19 Gen4 Maine - FAMILY: G19 Series MODEL: G19 G4 BATTLEFIELD GREEN TYPE: Semi-Auto Pistol ACTION: Safe Action FINISH: Gas Nitride STOCK/FRAME: Polymer Frame STOCK/GRIPS: Flat Dark Earth Polymer CALIBER/GAUGE: 9mm CAPACITY: 15+1 # OF MAGS: 3 MAGAZINE DESC: 15 rd. BARREL: 4" SIGHTS: Fixed SAFETY: 3 Safeties ADDL INFO: Interchangeable Backstrap ADDL INFO: Reversible Magazine Catch ADDL INFO: Textured Grip GUN CASE: Plastic.